Steve Boyle was a lock who played 312 games for Gloucester, scoring 77 tries and was noted for his ability at the front of the lineout and for his powerful scrummaging. He frequently scored tries from set piece moves. He won 3 caps for England and went on the 1983 British Lions tour of New Zealand. He played for Gloucester in two cup finals and won the County Championship with Gloucestershire. He also toured with England under-23 and England B and played for South and South West and the Barbarians. At the end of his career he played for Moseley. Stephen Brent Boyle was born in Warrington on 9 August 1953. He moved south and played soccer for Herefordshire Schools before moving to Gloucester in 1969 at the age of 16. He learned his rugby at Sir Thomas Rich’s School Gloucester. After leaving school, he played for Old Richians before joining Gloucester RFC. He made his Gloucester debut in 1972 but it was difficult for a young lock to break into the Gloucester first team where current international Alan Brinn and future international John Fidler ruled the second row. Steve gained an England Under-23 trial in April 1975 at Kingsholm but the breakthrough came in 1976-77 with his debut for Gloucestershire against Japan in September. The following month he took part in a 58-15 win for England Under-23 against Japan at Twickenham. He went on to play 33 games for Gloucester that season and for Gloucestershire against Lancashire in the County Championship semi final. At the end of the 1976-77 season he toured Canada with England Under-23 playing in both internationals and captaining the side against Alberta. England trials followed in 1977-78, a season when he was one of the “ever-presents” in Gloucester’s cup campaign, which culminated in a 6-3 victory over Leicester at Twickenham. He toured Romania with England B at the end of the season, playing in the international. The next four seasons 1978-83 saw Steve Boyle reach the peak of his career. In 150 games for Gloucester he scored 50 tries – remarkable figures for a lock. In Gloucester’s great season of 1981-82 he scored 15 tries in 36 games and played in his second Twickenham cup final. England selection finally came in 1982-83, a year in which he played in three of the four home internationals. He also played for Gloucestershire in their victory over Yorkshire in the CountyChampionship final at Bristol and for the Barbarians against East Midlands. But capping all this was his selection for the British Lions tour of New Zealand that summer. It was a just reward for an outstanding season. He played in 6 games, although he failed to break into the test side. Steve Boyle played again for the Barbarians against Newport and for Gloucestershire against Northumberland at Gosforth in October 1983. 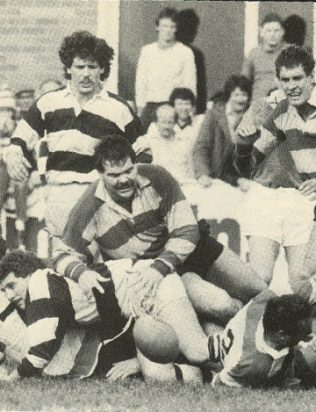 He played for the South & South West against the All Blacks at Bristol in November and appeared for a World XV against a Welsh XV at Stradey Park in April 1984. He played for Gloucester in the early part of the 1984-85 season, turning out in the back row in a 10-6 win at Coventry, before joining Moseley in November. On 22 November 1984 he played in the annual match between Stanley’s XV and Oxford University as a Moseley player. This was to be his final representative game, although he played regularly for Moseley for the remainder of 1984-85 – a very successful season for the club.